It was August 2015 at Idlewild Park in New York. 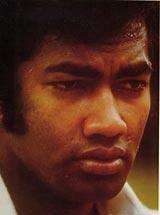 There were a number of greats of West Indies cricket. At the end of the game the young cricketers wanted to speak to only one of them. He willingly obliged and for the next few minutes he had them under his spell. Alvin Kallicharran spoke about the need for discipline, about keeping oneself fi t and above all to never to give up, even when a mountain is staring at you.